This year, we’re celebrating National Volunteer Week from April 6 to 12 in both the U.S. and Canada. 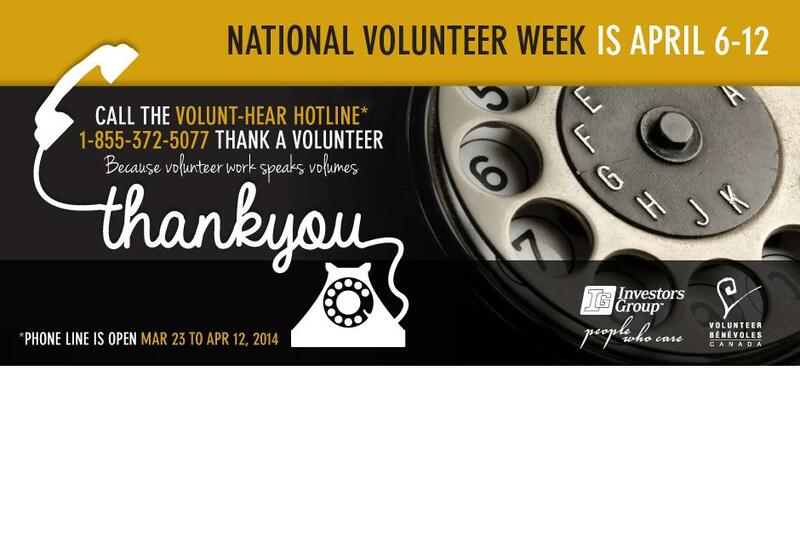 What is National Volunteer Week? National Volunteer Week is about inspiring, recognizing and encouraging people to seek out imaginative ways to engage in their communities. It’s about demonstrating to the nation that by working together, we have the fortitude to meet our challenges and accomplish our goals. Canadians from coast to coast are encouraged to call the Volunt-Hear Hotline and participate in a national conversation about volunteer recognition. The hotline is a toll-free number where people can call to leave a brief impact statement and say thank you to a volunteer for their efforts. Why? Because volunteer work speaks volumes! Messages will be organized into playlists on Soundcloud. Listeners will be able to share messages and hear first-hand how volunteer work changes lives and shapes communities. Click here and listen to an example of a message. Are you planning any volunteer recognition celebrations during National Volunteer Week? Volunteers are an essential resource for most non-profits and membership organizations. We hope you’re thanking them and recognizing their efforts regularly. But NVW offers an opportunity to really shine a spotlight on your volunteers! For inspiration, check out the resources available through Volunteer Canada and Points of Light and have a look at the additional resources we’ve offered below. Let us know what your organization has planned for celebrating your volunteers this week in the comments below. Volunteer Appreciation Guide - this article in our Membership Knowledge Hub offers some Volunteer recognition best practices; planning tips; ideas for formal and informal recognition; and our thoughts on the impact of showing appreciation. Show Volunteers They’ve Made a Difference - this posts offers highlight of a report from Volunteer Canada and the Investors Group, offering insight into best practices in volunteer recognition and retention based on two national surveys. Great enhancements and great info...thanks to ALL the Apricots! !